When two women give birth to twins at the same small town hospital at the same time the frazzled nurse accidentally switches one from each set. How will things play out when they're all grown up, staying at the same hotel and arguing over a business deal involving their dear birth place Jupiter Hollow? I've sung Bette Midler's praise before and I'll sing it again, she is SO entertaining...tralalalala! 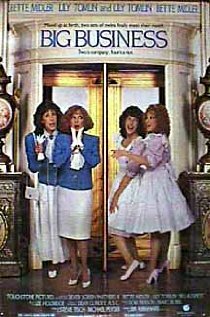 This old '80's classic was fun and entertaining and even though Midler stole the show, Lily Tomlin was pretty funny too. Just be sure you lower your standards for movie quality, as you need to with most of these '80's movies, cause the green screen effects and plot holes are imperfect and numerous but it's still a good time. Motherly Advice: This one cleaned up just fine. With filters on Medium there was still a little bit of innuendo here and there with a man buying condoms and a couple in bed looking worn out after an...eventful night. But if you hike those filters up to High these scenes are snipped out, along with some other mild scenes. So with filters on High there isn't much other content to report and I'd say it would be fine for the whole family, although the littler ones wont be very entertained.